Happy to be Blogging (Again!) ~ No Limits on Learning! After a lengthy absence from the blogging world, I'm making attempt number ?? to return. 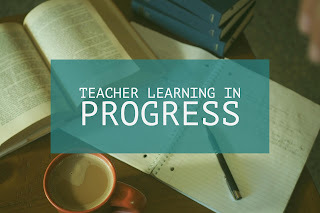 Inspired this summer by conference keynotes, other bloggers, and my own desire to be a more reflective educator, I thought I would try, try again. I started the alphabet journey in 2015, and it's a happy coincidence that I'm at letter H because this week I have the privilege of attending #ISTE17, and I know I can create a post for letter I. During one of my sessions in Dallas ISD this week, a teacher shared this nugget (thanks, Ed!) and I thought it was an awesome school policy. Would this procedure work for your campus? I also simply love the phrase Teacher Learning in Progress because that's what our journey is all about, right? When I started this blog several years ago, my focus was math, and I taught calculus at the time, so the "No Limits on Learning" title was fun (for math nerds) and appropriate, but I love how the blog title is still a perfect fit today. My learning is definitely in progress!